Alright, I have to confess- this project is SOOOO simple that it probably doesn’t warrant a full blog post…but I put one together anyway. 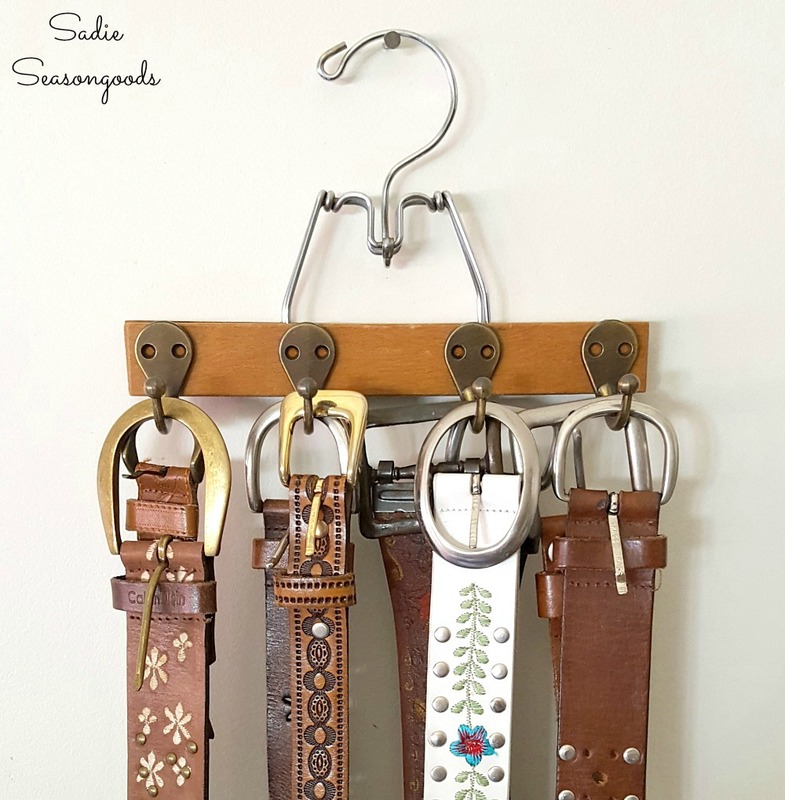 I hope you don’t mind…who knows, maybe it’ll come in handy for you anyway- especially since they are gifts for him – belt hanger or belt organizer made from vintage pants hangers! Some of you may already know this, but I used to make upcycled leather cuffs and sell them in my now-closed Etsy shop. Examples of what I used to sell! This means that I always had an inordinate number of belts in my craft room and it would get a little out of control! I decided I needed to do something about it…and here we are with this blog post. Years ago, I bought a dedicated belt hanger for Mr. Seasongoods…and after studying it, I realized how simple it would be to make my own knock-off version. It’s not exactly a complicated design and I knew right away what I would use. I’ve yet to repurpose a vintage wooden hanger, but it dawned on me that this would be the perfect way to upcycle one of those pants hangers – you know the kind I’m talking about…short wooden slats that clamp close (and clothes). Luckily for me, my good friend Kate DiNatale Vintage let me reach into her closet and snag a couple for this project. I’ve wanted to upcycle this kind of hanger for years! And now, my friends- the super complicated (I kid, I kid) tutorial! This post contains affiliate links for your crafting convenience. First, I bought some robe hooks- some in black, and some in antiqued brass. On my particular pants hangers, four hooks per side was perfect – belt hanger here I come! Using masking tape, I taped each hook to the pants hanger so I could mark the spots for the screws…or so I thought. Getting the drill out…and then putting it away. Whoops! Once we started screwing in the hardware, however, the tender old wood of my pants hangers started to crack! I’m not terribly surprised…so I decided to simply glue the hooks to the pants hangers. I used my favorite epoxy on one and a super strong glue on the other (and latter ended up being far easier to apply, FYI). I let them dry overnight, and boom- belt organizers / belt hangers for my crafting belts! …and now I have extra screws for my hardware jar! And there you go- it works perfectly as a belt hanger or belt organizer! I’ll probably be hanging these belt hangers on a wall so that my belts are all visible- but if you plan on hanging them in a closet, you could definitely add another row of hooks to the other side. Wouldn’t these be perfect as gifts for older men or anniversary gifts for me? Simple to make and old pants hangers are easy to find at thrift stores. Valenti gifts for him, Best Man gifts – so many possibilities with this DIY belt hanger project idea. See, I told you it was ridiculously simple…but I’m also ridiculously happy to have them made! Closet organization or closet solutions are always a good idea, especially when they’re this easy to make. 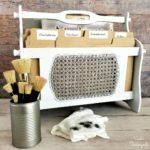 Looking for more cool gifts for guys that are DIY? Check out this collection here for inspiration for other upcycled and repurposed best man gifts! These would make great necklace hangers too! Just what I need. Great idea. Great attractive idea! sometimes the simple stuff is the best.Come share it Sunday at Family Joy Blog linkup. http://www.pursueyourproject.com Thanks! Now this project will reduce my aggravation in storing my belts. And it is a very stylish solution as well. SO clever, like all of your ideas Sarah! I really need one of these as well, my belts are all over the place and I don’t like that. This is easy, pretty and so functional= perfect!! This is awesome! 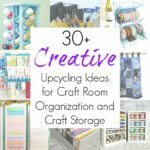 It may seem like a simple project, but it has potential to be an organizer for so many things. Such a great idea! I have lots of these hangers because I use them to hang kids’ art work, but now a couple will be made into scarf holders. Thanks for sharing! What a great idea! Thanks for sharing at the Pleasure of the NW’s DIY party! What a great idea! Great way to keep belts neat and organized. Be cute for organizing necklaces and bracelets as well. What a great idea! Easy and functional. Thanks! This is cool idea and I am going to make one. So clever! Thank you for sharing! I really like your cuffs, they are really cool and fun! And you have discovered a great way to organize your belts, brilliant! I don’t have many belts, but I do have scarves, this would be a great way to hang them all so I can see them in the closet and be able to choose one by looking at them all. Great idea! Great idea! Thanks for sharing at the #InspirationSpotlight party. Shared. This is such a great idea. I have one of these hangers and some hooks leftover from another project, I can hardly wait to make my own. Thanks for this awesome idea. Thank you so very much, Celeste! “Easy but WONDERFULLY functional!” Thank you very much! Je vous remercie! Je suis tellement heureux que vous avez aimé. Great idea! Are belts what you make your bracelet cuffs out of? Anyway, those are adorable! I always want to make one, but also afraid that the organizer is not strong enough to lift up these heavy belts. But your post lightens me up! For your idea of belt hanger is really creative. It looks different. Not only used as belt hanger but also hat, accessories, etc. Thanks Sarah. I made one, except I used Command hooks. So far they are holding. Oh Sarah… you continue to slay me with your genius junk takes. A pant hanger becomes a belt hanger… but of course it would! Too beautiful to be hidden in a closet I say! Featured you this weekend on DIY Salvaged Junk Projects 348. Thanks for linking up! Thank you SO very much, Donna- linked up my latest last night! I hope you are feeling better so that you can have a gorgeous, autumn-y, DIY-filled weekend!